George Whitefield, on this day, September 30, 1770, woke at 2am with an the beginning of breathing problems that he suffered from for some time and thought was asthma. He decided to take 2-3 days off of preaching to recover. Then soon after decided it would be better to preach that day. "A good pulpit sweat today may give me relief. I shall be better after preaching." Richard Smith, his assistant, responded, "I wish you would not preach so often, sir." Whitefield: "I would rather wear out than rust out." He sat up in bed, praying. When finished, he went back to sleep for an hour and then awoke at 4am barely able to breathe. That morning George Whitefield died, fighting for each breath, until he met his Savior face to face. Read more of Whitefield's thoughts on listening to a sermon. Who dost the sev’nfold Gifts impart. Keep far our Foes, give Peace at Home! But the question is: Why was Whitefield “acting”? Why was he so full of action and drama? Was he, as Stout claims, “plying a religious trade”? Pursuing “spiritual fame”? Craving “respect and power”? Driven by “egotism”? Putting on “performances” and “integrating religious discourse into the emerging language of consumption”? I think the most penetrating answer comes from something Whitefield himself said about acting in a sermon in London. In fact, I think it’s a key to understand the power of his preaching—and all preaching. James Lockington was present at this sermon and recorded this verbatim. Whitefield is speaking. Read or hear John Piper's entire bio of George Whitefield from the 2009 Desiring God Pastors' Conference. This is first post in a series. Here are links to posts that follow. Something has been burning in my belly. I can't shake it. I have a picture in my head of movement of preachers that, I believe, will shake up the culture and change the face of American Christianity in a myriad of good ways. I have much more to say about it, but let me start simply. What if evangelicals hit America with 200, or 500, or 1,000 theologically strong, gospel-centered pastors who start preaching in open-air and public places in their cities, beyond their Sunday morning worship services, at least once a week for the rest of 2011? What would happen? What if even more did it, or what if it was done more often (Whitefield preached an average of 20 times a week for 34 years)? This idea has been on my mind in some form since my first few weeks as a new Christian (almost exactly 17 years ago). It continued through seminary as I did many outdoor evangelism projects and wrote a paper in seminary on open-air preaching. I've discussed it over the past few years with Joe Thorn. In the last few weeks I believe God has pressed this idea into me. I'm compelled to put it out there knowing many will probably think I'm stupid or crazy, and I'm ok with that. 1. The Gospel would spread, maybe in an unprecedented way, across our land. It would be heard by people who would never set foot in our churches. It would spread in other ways explained below. 2. Our pastors and our people would be forced to learn to explain the Gospel simply, answer objections, etc. This would spark more training in theology, evangelism, apologetics, etc, but this time with a sense of need rather than something we too often learn for our "personal growth" only. 3. A *buzz* would grow among our neighbors. Suddenly it would be hard to miss seeing and/or hearing the Gospel where we live and in the places we go. People will stumble across it sooner or later, and probably more than once, and it will shake people up. Instead of being the odd guy down at the outdoor mall, it will be respected, calm, thoughtful, theological, loving people doing it. It will open a conversation as to "why" this is suddenly everywhere. 4. Persecution of one form or another (or all forms) would naturally increase. We are mostly left alone in our buildings, but when we preach with biblical power in the open-air the Devil will not be pleased. 5. The stereotype would change of open-air preaching and open-air preachers as the "turn or burn" and "sandwich board" folks would be drowned out by good, biblical, evangelistic preaching. It would come across as more normal because good preachers are doing it, yet it would still shake things up. 6. The media would take notice and start asking us what's going on, and we'd get free airtime to talk about Jesus. It would spark a growing public conversation about things on our agenda instead of merely getting asked to chime in when we fit in with the world's agenda. 7. Dozens, hundreds of doors for personal evangelism would open up in every place public preaching is done because some of our people will attend and strike up conversations with those who stop to listen. In other words, we create a clear pathway for immediate personal evangelism. The preachers cast nets to draw them in, our people cast hooks, and together we work out our different roles in evangelism. 8. We would begin to pray with a new fervency, boldness, and deep need like in the end of Acts 4.. We would find ourselves relying on God in ways we've ignored because we take few risks. Our prayer meetings would, without question, see less "pray for aunt Sally's leg" and see more prayer for salvation, for strength, for the words to speak, for courage and boldness, for the many different issues that will result from the preaching, and so on. 9. Our churches would immediately start to see more visitors. The seeker kind. The skeptic kind. The curious kind. This would come because of the people who want to hear more from the preacher and the people who have connected personally with Christians during public preaching. They will come because this is the preacher who doesn't play well with others, and this time not because they spew judgments but because they won't stay away in their safe, warm buildings. 10. Christians will be separated from "Christians." Dead churches and denominations, the ones that don't have nor preach the Gospel, will start to look clearly different from evangelical ones. Our preaching will force the issue because people of various "Christian" groups will hear and react differently. Christians without Christ will be challenged to leave their Gospel-less churches and denominations. It will create a challenge to the peaceful, live-and-let-live relationship happening among all groups called "Christian" in our cities and it will reopen a necessary discussion on issues of Gospel, truth, theology, heresy, etc... and all in a much more public way. No sort of defense is needed for preaching out of doors; but it would need very potent arguments to prove that a man had done his duty who has never preached beyond the walls of his meeting-house. A defense is required rather for services within buildings than for worship outside of them. I believe that if in the next couple of months hundreds of preachers in America would embrace this, and public preaching started happening all over the place, especially with the spring and summer months coming as the perfect opportunity, that we would see amazing things happen by the hand of our good and gracious God. I believe we would see mighty works by the Holy Spirit. I believe it would be amazing, but we would have to do it in order to see it. A lot of questions remain, I know. A lot of doubts. You may be skeptical that it can work. You may be wondering where you could even do it in your particular community. You may have fears of doing it and desire to stay in the comfort of your pulpit. I hear you, but I think there are good answers and motivations for all of this. More soon. My prayer as this goes up is that God will stir in us by His Spirit a movement of preachers who preach the Gospel publicly, beyond the walls of our buildings. I'm praying first for myself, then for many of my friends and pastoral acquaintances by name, and then for a number of well-known pastors who I think God has put in places of influence for their theological strength and solid preaching of the Gospel. I believe we need older, mature pastors to lead us in something like this. God help us to preach the Gospel boldly and publicly. It was as blessed day when Methodists and others began to proclaim Jesus in the open air; then were the gates of hell shaken, and the captives of the devil set free by hundreds and by thousands. Once recommenced, the fruitful agency of field-preaching was not allowed to cease. Amid jeering crowds and showers of rotten eggs and filth, the immediate followers of the two great Methodists [Whitefield & Wesley] continued to storm village after village and town after town. Very varied were their adventures, but their success was generally great. One smiles often when reading incidents in their labours. A string of packhorses is so driven as to break up a congregation, and a fire-engine is brought out and played over the throng to achieve the same purpose. Hand-bells, old kettles, marrow-bones and cleavers, trumpets, drums, and entire bands of music were engaged to drown the preachers' voices. In one case the parish bull was let loose, and in others dogs were set to fight. The preachers needed to have faces set like flints, and so indeed they had. John Furz says: "As soon as I began to preach, a man came straight forward, and presented a gun at my face; swearing that he would blow my brains out, if I spake another word. However, I continued speaking, and he continued swearing, sometimes putting the muzzle of the gun to my mouth, sometimes against my ear. While we were singing the last hymn, he got behind me, fired the gun, and burn off part of my hair." After this, my brethren, we ought never to speak of petty interruptions and annoyances. The proximity of a blunderbuss in the hands of a son of Belial is not very conducive to collected through and clear utterance, but the experience of Furz was probably no worse than that of John Nelson, who coolly says, "But when I was in the middle of my discourse, one at the outside of the congregation threw a stone, which cut me on the head : however, that made the people give greater attention, especially when they saw the blood running down my face; so that all was quiet till I had done, and was singing a hymn." Here's a list of books I own on revival that I'll be using in one way or another for my current sermon series Revival: Longing for a Surprising Work of God. I tried to list them in the order of how much I expect to use (or depend on) each one for this series. I'm referencing a number of other things as well (articles, audio, websites) but this list is for books alone. UPDATE 2.8.11: I added some new books at the bottom, and a few comments in parentheses where I have something to say, so far. I'd love to hear your suggestions for other books on revivals or about revival. I also assume as I peruse my personal library I could add a few to this list that I overlooked. Help me think about the "Public Square." I have a lot of this stuff in my head and I want to get it out there and see where I'm wrong, right and what to do about it. 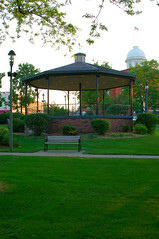 A public square, or particularly a "town square", is a place, historically an intersection of important crossroads for trading of goods as well as the sharing of ideas. I live in a town square city. If you visit my city, Woodstock, IL, that's the place to visit. It's quaint, beautiful, historic, and well organized. If you showed up on a random day you might find a farmers market nearly all the way around the square, or a wedding or band concert in the gazebo, or a group of youth hanging around on a bench, or a fair that brings in people from some distance to visit and shop, or a family having a picnic in the shade, or a Groundhog Day celebration at dawn, or a car show, and on and on it goes. And that's just the center park area. Around the outside are permanent stores, the Opera House, an art gallery, restaurants and more. After 6+ years here there's one thing I haven't found in our public square: The Gospel. A lot has changed both with goods & ideas. The public square of goods is now mostly at Wal-Mart (a drive away, but everything you need is there, not just specialty items at the farmers market). The public square of ideas is TV or the Internet where the talking heads (of whatever sort) give their side of the story, or deliver their breaking news, and so on. Even local stuff is discussed more and more on Facebook than through actual interaction with friends and neighbors. We've learned about local concerns, missing/runaway kids, meetings, etc often on Facebook first. Our local newspaper tries to create this a bit by having comments under each article, but the anonymity of it creates a culture of sniping rather than thinking or caring or doing something in response. There are some great stories of how Christians have used the public square in the past. Biblically, guys like Paul go into the marketplace where he can interact with all sorts of folks. That leads some of the local philosophers to bring him to the Areopagus (Mars Hill) for a more intellectual presentation as someone with a new idea. We tend to think of the Areopagus as the public square, but it isn't. It's more of a private, formal forum for certain intellectuals. The public square was the marketplace, the less formal place, the everyone-passes-through-here place. Back in seminary I remember reading and hearing stories of missionaries to the American frontier and circuit rider preachers and evangelists. I was so taken I wrote a paper on open-air preaching. I'm sure you've heard grand stories of the public preaching and impact of men like George Whitefield and John Wesley. The public square and open-air was a crucial space for these men and their ministries. It wasn't always a place of acceptance, as tomato stains would testify. Those are some great stories too. Now some, surely, will be concerned over a re-imagining of using the public square because of how a few have used it. Some of you are not eager to be associated with Kirk Cameron or the mimes who trap themselves in a box only to show that Jesus is the way out. I hear you. But I can't help but to think that someday we will look back at TODAY as a come-and-see, affluent, hidden time in American Christian history. That we will wonder why we didn't take the good news and release it through public heralding sooner. That we will study how this was the time when our public preaching was through advertising and marketing and little more. I'm not sure the answers, but I think the questions are important. I think there's something we're leaving to the "crusades" and quacks that we aren't supposed to leave to them. I think that our disdain for what goes for "public preaching" nowadays isn't enough to keep us from figuring out how to do it better, how do it right. UPDATE: Read my follow-up post: "The Kids Downtown." Crossway has put out a wonderful, small book for Advent called Come, Thou Long-Expected Jesus: Experiencing the Peace and Promise of Christmas . It contains 22 4-8 page readings from sermons and works of dead folks (like Martin Luther, J.C. Ryle, George Whitefield, Jonathan Edwards, Charles Spurgeon, and more) and living folks (like Tim Keller, J.I. Packer, R.C. Sproul, Joni Eareckson Tada, John Piper, and others). Pick it up. When September 11th happened and New Yorkers started to suffer, you heard two voices. You heard the conventional moralistic voices saying, "When I see you suffer, it tells me about a judging God. You must not be living right, and so God is judging you." When they see suffering they see a judgmental God. The secular voice said, "When I see people suffering, I see God is missing." When they see suffering they see an absent, indifferent God. But when we see Jesus Christ dying on the cross through an act of violence and injustice, what kind of God do we see then? A condemning God? No, we see a God of love paying for sin. Do we see a missing God? Absolutely not! We see a God who is not remote but involved. We sometimes wonder why God doesn't just end suffering. But we know that whatever the reason, it isn't one of indifference or remoteness. God so hates suffering and evil that he was willing to come into it and become enmeshed in it.